A lateral meniscus tear is an injury to the semi-circular cartilage on the outside of the knee joint. It can occur suddenly from twisting or a traumatic injury. Or it may develop gradually through wear and tear. Symptoms of a lateral meniscus tear will vary depending on whether the injury is an acute, sudden onset injury from direct impact, trauma or twisting, or whether the injury has developed gradually over time through degeneration. With acute knee cartilage injuries, the patient will feel a sudden pain at the time of injury. There will be tenderness around the outside surface of the knee, particularly along the joint line and there is usually swelling which appears within 24 to 48 hours. 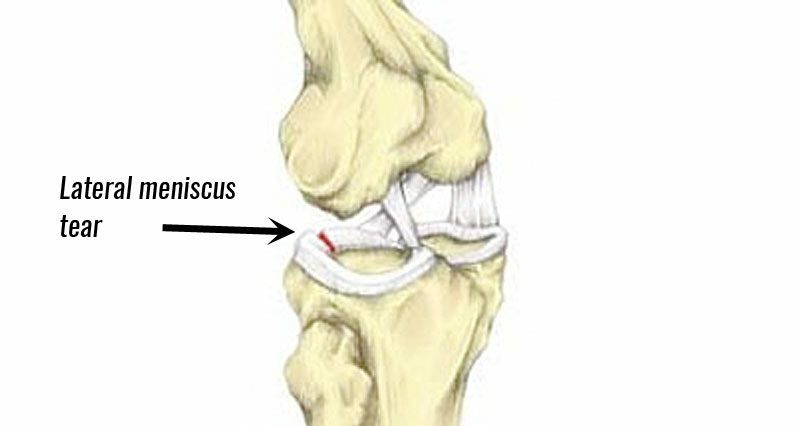 Chronic meniscus injuries will develop over time with the patient not knowing precisely when the injury occurred. In children particularly, meniscus tears may be difficult to diagnose as pain may be vague and difficult to pinpoint. There may be swelling, pain and tenderness along the joint line and pain when bending the knee or squatting. The patient may experience a snapping or clicking sound and the knee joint may lock. A doctor or athletic trainer will do a full knee assessment including specific assessment tests to confirm the diagnosis. These will include McMurray’s test and Apley’s test. An MRI scan will confirm the diagnosis. McMurray’s test is often used to indicate cartilage injuries. With the patient laying on their back the therapist holds the knee with the upper hand and the heel with the lower hand. The therapist then applies a valgus (inward) stress to the knee whilst the other hand rotates the leg externally (outwards) and extends the knee. Pain and/or an audible click while performing this maneuver can indicate a torn medial meniscus. Apley’s test is also used in cases of suspected meniscus tears. The patient is positioned on their front with the knee bent. The therapist grasps the heel and ankle and applies a compressive force through the lower leg. At the same time, they rotate the lower leg. Any reproduction of symptoms, pain or clicking is a positive response, suggesting a torn meniscus. The lateral meniscus is less prone to injury than the medial meniscus. This is because it doesn’t attach to the lateral knee ligament in the same way that the medial cartilage meniscus attaches to the medial ligament. A tear of the lateral meniscus can occur during twisting movements, direct impact to the knee joint, deep squats or due to degeneration of the cartilage, particularly in older athletes. Degenerative Changes may lead to the edges of the menisci becoming frayed and jagged. 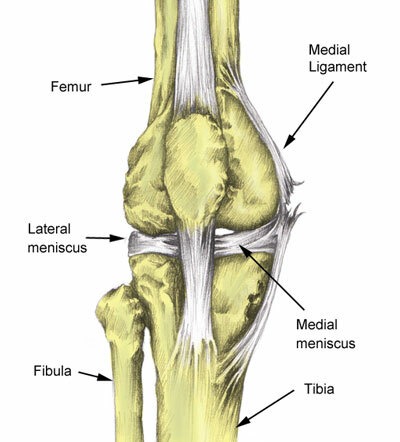 A longitudinal meniscus tear is a tear that occurs along the length of the meniscus. A bucket handle tear is an exaggerated form of a longitudinal tear where a portion of the meniscus becomes detached from the tibia forming a flap that looks like a bucket handle. Treatment for a lateral meniscus tear would initially be conservative meaning the athlete would try the easy simple things first including rest. If this approach doesn’t work then a doctor may recommend surgery. If there is swelling PRICE principles should be applied (protection, rest, ice, compression, and elevation). Gentle exercises to maintain quadriceps muscle strength in the thigh can be done, although care should be taken not to aggravate the symptoms. Wearing a knee support can help protect the joint while it heals. A glucosamine joint healing supplement may be beneficial for healing cartilage injuries. Seek professional medical advice as surgery may be indicated, especially in active sports people or if the knee locks or gives way. The first aim of the professional therapist will be to correctly diagnose the injury. They may do this by using specific tests for meniscus tears such as a ‘McMurrays’ test. An MRI scan may be needed to confirm the diagnosis and extent of the injury. Once an accurate diagnosis is made the decision of whether to treat conservatively (without knee surgery) or whether surgical treatment is required can be made. 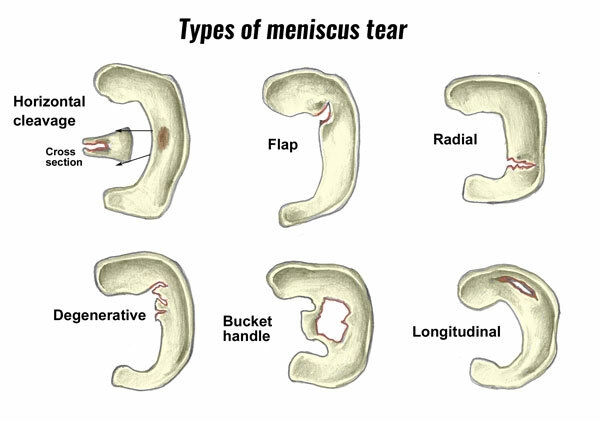 Conservative meniscus tear treatment may be indicated in the case of a small tear or a degenerative meniscus tear. Once pain has subsided, the therapist will advise on exercises to increase the range of movement at the knee joint (if needed), along with strengthening, propriception and functional or sports specific exercises should be done. In the event of more severe meniscus tears such as a bucket handle tear, arthroscopic surgical procedures may be necessary to repair the lesion. The aim of surgery is to preserve as much of the meniscus cartilage as possible. The procedure itself will normally involve stitching of the torn cartilage. The success of the surgery depends not only on the severity of the tear but also on the age and physical condition of the patient. Younger and fitter patients are known to have better outcomes. Following surgery, a rehabilitative exercise program will be outlined for the patient which may include strengthening and balance training. Full co-operation with the rehabilitative technique will be necessary to maximize recovery. View expert interview with a surgeon: Mr. Richard Villar on knee cartilage surgery. Read more on knee meniscus rehabilitation. Andrish JT1. Meniscal Injuries in Children and Adolescents: Diagnosis and Management. J Am Acad Orthop Surg. 1996 Oct;4(5):231-237. Kocher MS, Klingele K, Rassman SO. Meniscal disorders: normal, discoid, and cysts. Orthop Clin North Am 2003;34(3):329–40.